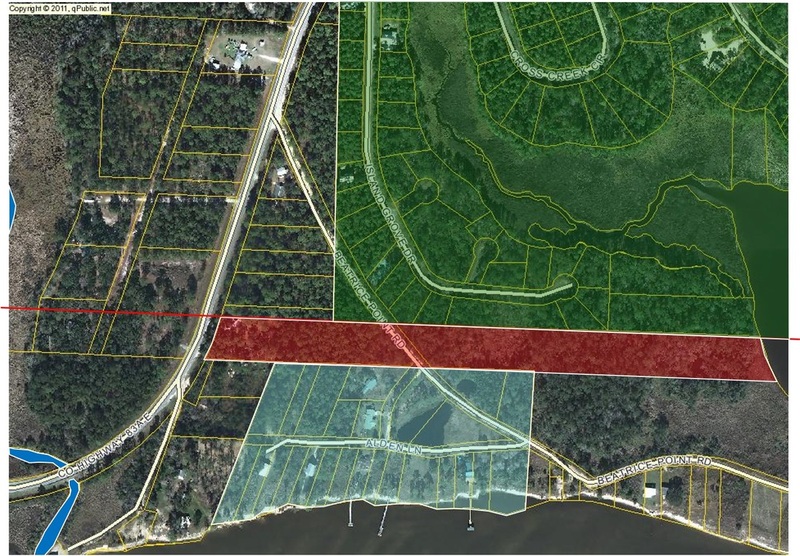 Walton County and the State of Florida have devised and allowed a unique solution to any problem with a hiatus or land once identified in one section, and later identified in another. Any person is allowed to file a Quit Claim Deed to themselves into the public record and thus “create a chain of title”. Many that do this action end up owning this public land for free, or rather for the price of doc stamps. The County Tax Appraiser will even sign your Quit Claim Deed as a witness. The area highlighted in red below is a hiatus that was noted on a Florida DOT survey between Sections 29 and 32. The area outlined in green is the subdivision of Cross Creek with the bottom line of subdivision shown as the bottom line for Section 29 (top line of 32). The light green area shown below the red area of hiatus is the subdivision of Bayou La Grange with the top line of subdivision shown as the top line of Section 32 (bottom line of 29). The GLO surveyed the entire area of discussion in the photo as located in Section 29. The total land mass of Section 32 was a small 18.5 acre pie shaped piece of land on the left side of the creek shown in the lower left corner.